Our 2019 walk will be breaking new ground in that we will be taking walkers across a section of the Glen Muick Estate that we have not previously visited, in what promises to be an interesting and unusual “end to end” walk. The walk will start in Ballater and then cross the Dee and on to the new footpath that runs alongside the B976 to the Glen Muick Bridge. From here the route will climb up past Balintober to the shoulder of Craig Vallich. As you climb out of the valley take the time to look back to the views across the Dee Valley and west to the Coyles of Muick and Lochnagar; even for those who are familiar with this part of Deeside this will give an unusual perspective on these familiar hills. From the high point on Craig Vallich there are 360 degree views of the Cairngorms and the hills of lower Deeside. Definitely a spot to stop and take on some refreshment and just wonder at the amazing scenery of this part of the world. From here the route then takes the old Mounth Road path across to Lach an Gualainn. As you traverse this path you will slowly see revealed Mount Keen and the hills on the south side of Glen Tanar. The stalkers track leads down into Glen Tanar and then across the Water of Tanar. 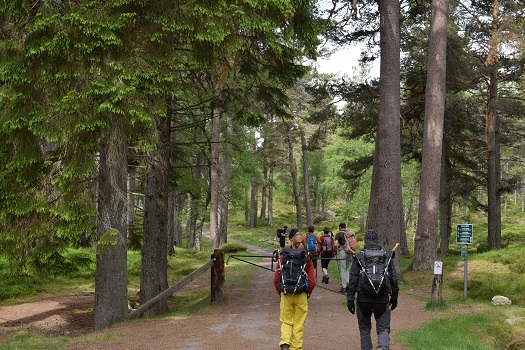 At this point we will connect with a section of the route that we have used previously skirting Red Craig, Black Craig and Clachan Yell before dropping down through the wonderful Forest of Glen Tanar. The walk then follows the track on the south side of the Water of Tanar to the Visitor Centre at the Bridge of Tanar where refreshments will await. The overall length of the route is approximately 25 kms, and it should be remembered that, although the route will be marshalled and patrolled by members of the Team, it is a remote mountainous environment and adequate and appropriate clothing and footwear should be worn. We are delighted to be able to offer this new, and we believe highly unusual route across from the Valley of the Dee to Glen Tanar. We look forward to seeing you on Saturday 8th June 2019.